This project seeks to develop these opportunities by creating a StoryTrek prototype in order to engage literary tourists/Ian Rankin readers in the physical spaces where the writing is set. 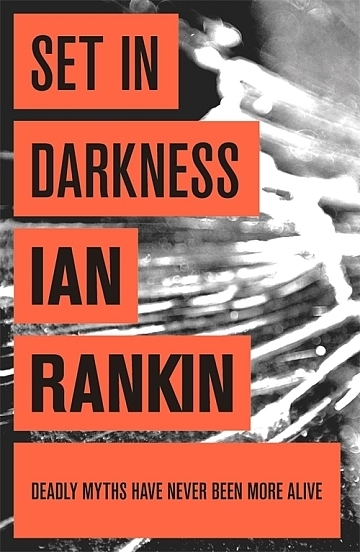 The prototype locative narrative will enable readers to move through Edinburgh while listening to an Ian Rankin/Inspector Rebus novel – Set in Darkness (2000) – that has been specially adapted for this purpose. StoryTrek aligns the user’s physical location with story segments activated by specific motion patterns. The StoryTrek system makes it possible to create complex, ‘augmented reality’ multimedia narratives – in this case, an adaptation of Rankin’s Set in Darkness, which has been chosen because it brilliantly places the city of Edinburgh (its physical spaces, its dark history, its myths) at the centre of the narrative and hence lends itself to this kind of adaptation. The software also enables the layering of historical maps and photographs over the contemporary map of Edinburgh (that will form the basis of the application), thereby allowing end-users to see how the city has evolved. This is especially significant in the case of Set in Darkness, which is centrally about the dynamic relationship between Edinburgh’s past and present. Orion’s audiobook version of the novel, which has been licenced to the project. Golden Days, Silver Nights is inspired by 19th century utopian writing. Told through audio voice over, archival images, and original artwork, this multimedia dystopian story asks what the world might have looked like had Presidential candidate William Jennings Bryan won the contentious 1896 election in the United States. We have designed a diminished reality interface that strips away the real world to show possible futures that might have been. This locative media narrative was developed using the StoryTrek locative media authoring system. Building upon our StoryTrek authoware, we’re working closely with the HOTSoft Lab, GIGL Lab and Western’s SocioDigital Lab to develop a tool that combines the benefits of physical stack searches with assisted web browsing, integrating physical and digital information in a seamless, intuitive interface. STAK will bring together automated data mining tools, dynamic processing, and situational guides in a hand-held, touchscreen device capable of directing a user’s research path through virtual and physical data sources simultaneously. This research has been supported by a Research Development Initiative Grant from the Social Sciences and Humanities Research Council of Canada and the GRAND NCE. STAK – Serendipitous tool for augmenting knowledge: A conceptual tool for bridging digital and physical resources. Digital Studies / Le champ numérique 9 (10 Feb. 2017). Using our StoryTrek authorware, I am creating an “archival atlas” of New World utopias and dystopias. By mapping archival city narratives, photos, plans, blueprints and visionary descriptions onto actual geospatial sites, I use the city streets themselves as an open, interactive and dialectical interface to historical narratives of urban upheaval and renewal. The archival atlas project combines literary and cultural critique with new collaborative tools for multimedia spatial analysis, tracing continuities between the earliest radical media and recent forms of networked activism. It aims to theorize the transition from textual archives to narrative databases, linking social and cultural geographies to recent debates over the future of libraries and the printed book. This research is supported by a Standard Research Grant from the Social Sciences and Humanities Research Council of Canada. Lansdowne Park is a 40-acre heritage site in the heart of Old Ottawa South. Home to agriculture fairs, military parades, and the Central Canada Exhibition since 1888, Lansdowne was recently “revitalized” by a controversial plan chosen without any design competition, altering this historic landscape to make way for commercial interests. We are preserving the park in a “diminished reality” memorial that uses the landscape as an interface to the historical record, giving local communities the opportunity to rethink Lansdowne’s design. With a mobile device in hand, visitors will be able to walk forward into the park’s possible futures or, by reversing direction, move time backwards and undo the current creative destruction, through a virtual demolition that recovers forgotten visions of the future park that never came to pass. Instead of augmenting reality, we want to strip it away to reveal how diminished our own present reality is compared with these forgotten and repressed alternatives. If deductive reasoning builds valid conclusions from known premises, and inductive reasoning derives laws from sensory data, then abductive reasoning builds models and hypotheses (which may or may not be either valid or actual) to explain the known facts. We are designing an “abducted reality” system to help provide possible explanations for the design of our physical environment. By combining our StoryTrek locative hypernarrative system with a head-mounted camera, 3D visor and IR motion tracker, we will abduct known reality, and replace the familiar spaces in which we live and work with hypothetical, experiential and contextualized alternatives. Our initial testbed involved the creation of a new kind of game, a utopian-themed Abducted Reality Game (A->RG), called Isolation U. At Isolation U., your avatar is a zombified undergrad at a post-apocalyptic campus, trying to survive the conformity virus. The game uses storytrek’s locative and motion-aware properties to enact a multiplayer quest that explores ideas of individual and collective agency, through the symbolic landscape of Carleton. In the process, gamers learn about Carleton’s history, and speculate on its future. My dissertation examines the shifting treatment of digital human characters within Hollywood cinema. It observes a marked transition from the notion of the digital actor, or “synthespian,” as a perceived replacement for the human actor, to that of the digital character, which facilitates the performance of a Hollywood star at the same time as it eases the cross-media translation of the digital character as a kind of intellectual property. I consider how the construction and reception of the digital human has been shaped by the growing intersections between cinema and video games in the age of media convergence, paying special attention to how the relationship between actor and character has been re-configured as a kind of gamer-avatar framework where the actions of a human star ‘drive’ that of their (usually transformative) digital character. I examine what is at stake when this re-configuration increasingly co-exists with a broader transmediation of the digital character across various ancillary media platforms, where the consumer/spectator may take the reins and operate the digital character-as-avatar. We are developing a unique mobile interface for exploring the history, construction and continuing cultural impact of Ottawa’s Rideau Canal, a World Heritage Site, for the Virtual Museum of Canada. Heritage Passages will draw on materials from the Heritage Conservation Research Collection of the Archives and Research Collections (ARC) at Carleton University and Ottawa’s Bytown Museum to reveal a series of intertwined narratives. Digitized artifacts, texts, photos, video interviews, and architectural/engineering drawings will be interpreted through a series of interpretive paths, or “passages,” linked to a detailed, navigable timeline that tells the story of the canal’s conception and construction. These materials will also be linked to detailed architectural models of the locks and associated buildings, to be developed by the Carleton Immersive Media Studio (CIMS) with the aid of laser scanning technology. The exhibition will be available remotely via a standard web browser or, while on site, through a smartphone application developed using our proprietary StoryTrek authorware. Visitors will be able to download a GPS-enabled, augmented reality smartphone application providing on-site access to archival materials directly from significant locations along the canal. J. Whitson & B. Greenspan. “Whether to Play or Preserve the Past? : Creating The Forgotten Worker Quest”. Proceedings of Foundation of Digital Games 2013, Chania, Crete, May 14-17, 2013, Society for the Advancement of the Science of Digital Games. I am interested in how game developers, especially programmers, encourage some player behaviors, such as content creation, while reducing other behaviors, such as griefing, cheating, and hacking. This is part of a larger project that studies the relationship between developers and players. My hypothesis is that developers’ duties and the larger process of making games is changing due to the increasing emphasis on emergent open-ended gaming, the growth of both social gaming and user created content, and the increased ways to gather player feedback (e.g. game session data, forums, and fan sites). Why this project is needed: Current social science research on games is focused on players. Reseachers critique games themselves, or they study player interactions in game spaces. This research ignores game development entirely and makes assumptions about how games are made and why without talking to anyone involved in the production process. While many professions work together to produce games (designers, writers, artists, producers, management and marketing personnel, etc.) 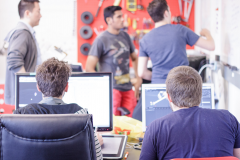 the role of developers and programmers is especially overlooked. The concept for the project “Move” came from an initial desire to produce a locative media based on the life and work of Duncan Campbell Scott, Canadian Confederate Poet and Superintendent of the Department of Indian Affairs from 1913-1932. Much of Scott’s life and work has molded the Canadian character through the exclusion and expulsion of Canada’s First Peoples. While numerous locative media projects have attempted to bring forth forgotten histories, voices and sites, there has been little exploration into creating an embodied understanding of exclusion through locative media. This experiment in “Diminished Reality” draws on disability studies and new media theory to explore the possibility of creating an embodied or phenomenological experience of immobility through locative media. The project is conceived as five separate segments that a user will be able to access through a mobile device. The segments are not mapped onto particular spatial coordinates; rather, spatial parameters are established once a user turns on her device. This allows a user to have an experience of immobility wherever she finds herself, and speaks to the reality of various individuals’ experiences of immobility. The segments do, however, have an order that orchestrates a process of transformation for the user through which they are rendered immobile.This research is supported by a Research Development Initiative Grant from the Social Sciences and Humanities Research Council of Canada. StoryTrek is a new hypertext system for mobile computing that adds fine-grained locational functionality to our current “live hypernarrative” system (Greenspan et al. 2006), an adaptive, online e-literature engine that builds stories on-the-fly from data mined in real time from the internet. 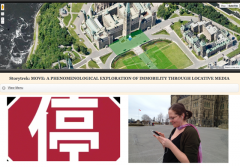 With funding from SSHRC’s Image, Text, Sound and Technology (ITST) program, we are integrating textual interfaces with GPS and digital mapping tools for the delivery of site-specific information in narrative form, allowing authors to create narratives that are geospatially sensitive and location-specific. This research was supported by an Image, Text, Sound and Technology Grant from the Social Sciences and Humanities Research Council of Canada. Greenspan, B. (2009). “StoryTrek: A System for Itinerant Hypernarrative”. Ruth Page and Bronwen Thomas, eds., New Narratives: Theory and Practice, University of Nebraska Press. Greenspan, B., Khaled, R., Barr, P., Eaket, C. and Biddle, R. (2009). “The Bias of Hypertext: Linking Narrative and Locative Media. Presentation for MIT6:Stone and Papyrus, Storage and Transmission, International Conference,Massachusetts Institute of Technology, Cambridge, MA, April 24-26, 2009. The objectives of this project, which received funding from the Ontario Research Network for Electronic Commerce (ORNEC), were to model the scripting approach currently used by our industry partner, Distil Interactive, to survey existing scripting approaches used for hypertext narratives and serious games, and to apply the assessment model of “cognitive dimensions of notation”. Outcomes included the creation of two new theoretical frameworks for studying digital games: the Playscripts model for analyzing the multiple strands and levels of scripting in computer games (presented at FuturePlay 2007); and the Neo-Immersive approach to game technology and player engagement. This research was supported by a grant from the Ontario Research Network for Electronic Commerce. We developed a new kind of dynamic or “live” form of hypernarrative, in which the content and structure of stories is determined by live information. This system would ultimately allow the creation of hypermedia narratives capable of mining public databases on the fly, in order to customize and integrate narrative material appropriate to the user’s particular temporal and geospatial context. Unlike other forms of hypermedia, a live hypertext narrative can actually be different every time it is read. More akin to an improvised performance than a recorded one, a live hypertext changes depending on where and when it’s accessed, and on what’s happening in the world and on the Web. Live hypertext thus presents a new development in the history of writing that challenges our inherited notions of the stability, fixity and even authority of printed text. This research was supported by an Initiatives for the New Economy Grant from the Social Sciences and Humanities Research Council of Canada. “Live Hypernarrative and Cybercartography: You Are Here, Now.” Cartographica: The International Journal for Geographic Information and Geovisualization, Vol. 41, No. 1. (1 January 2006), pp. 35-46.